Our Guardians followed colored eggs back to the community of Village Walk to help participate in their annual Easter festivities on April 15th. 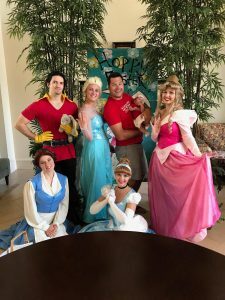 Our wonderful princesses and the always self complementing Gaston, traveled from their respective castles to come play with the families of the Village Walk community. The event started with a bunny hop sack race where we cheered on the little hoppers. Guardians of Justice celebrated Halloween by volunteering at the VillageWalk community “Villains & Heroes” Halloween Parade! Guardians of Justice sent forth Maleficent, Cinderella, and Raven to help the residents enjoy the most costumed holiday on the calendar. 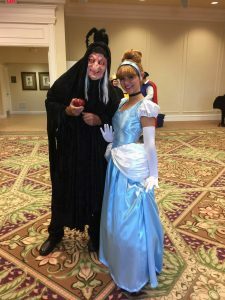 Instead of trick-or-treating, residents, children, and even some dogs (festooned in their own splendid canine costumes) converged upon the clubhouse for a grand Disney-themed party! Additionally, volunteers from the community were proudly bedecked in costumes designed and sewn by the Guardians’ own Elizabeth Hall. 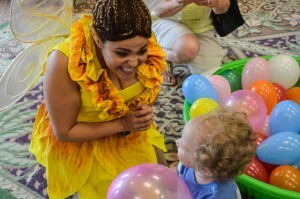 The party roared with about 100 children scurrying about the scene visiting Disney heroes and villains. On an early September evening, Guardians of Justice gathered to join force-friendly festivities at Cranes Roost Park in Altamonte Springs. Our organization was requested to appear at the Sunset Premiere of Star Wars: The Force Awakens. 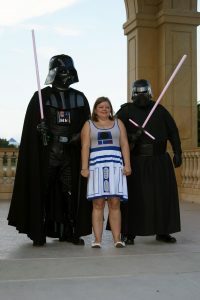 As the representation of Star Wars characters has been growing within our group, we jumped at the chance to finally represent our organization at Altamonte’s favorite park and home of Red Hot and Boom. Prior to the start of the movie while families were scoping out their spots in the grass, our members gathered and posed for photos before showtime. 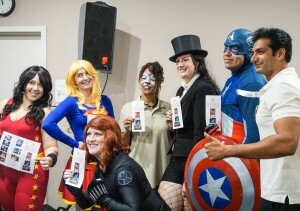 Astor Geek Fest – Get Your Geek On! 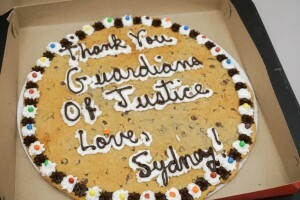 On August 6th, our Guardians of Justice reach ended up sprinkling throughout greater Central Florida! While some of our Guardians attended their first day at Tampa Bay Comic Con, we also found ourselves in a random little piece of Florida to host as exhibitors at the pilot Astor Geek Fest. You’ve never heard of Astor, Florida? It was our first time, too! So we buckled in bright and early, ready for a new adventure ahead. Weekend-goers at West Oaks Mall certainly had a surprise in store for them when they walked onto the scene of the Read to Sydney memorial event held on August 13th to celebrate her life and work. Guardians of Justice had the pleasure of meeting Sydney, an Australian Shepard / chow mix, a few months ago who was an accredited therapy dog that brought comfort and encouragement to children and adults alike. Sydney and her owner, Thom, were often found in schools and libraries where children, who may be a little shy, were given the opportunity to read aloud to her. 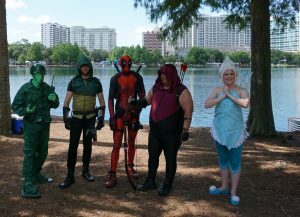 Guardians of Justice were invited to attend the annual event “Make ‘em smile” presented by Nathaniel’s Hope at downtown Orlando’s Lake Eola park on Saturday, June 4th. The day was warm and muggy as five characters gathered at Bright Start Pediatrics’ tent to take photos and interact with the children. Nathaniel’s Hope has been hosting this annual event for fourteen years now and Guardians of Justice has been in attendance for three of those wonderful 14! We saw so many familiar faces from years past! This event is special because everything is set up with VIP Kids and their extended families in mind. Guardians Get a Kick Out of Kraze Krush Jamboree! 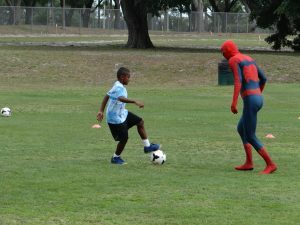 On the bright and sunny afternoon of Sunday, May 15th, Guardians of Justice kicked it into high gear to support the Florida Kraze Krush Soccer Club Jamboree. The good folks at TOPS hosted the event at Central Winds Park to gather all the programs in the Florida Region B (Orlando, Ocala, Daytona all the way to Jacksonville) to celebrate a great year for these special kids who love the game of soccer. Even a cloudy day couldn’t dim our smiles. 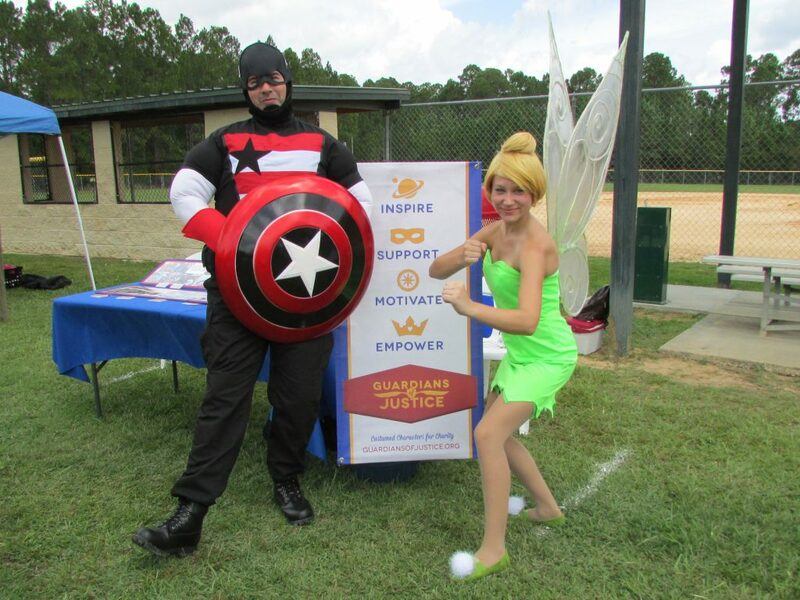 Guardians of Justice were extremely happy to be invited back to the Autism Family Fun Day at Central Florida Dreamplex in Clermont, Florida. On Saturday, April 2nd 2016 an array of characters assembled to partake in the festivities. We saw many of the same faces from last year, including some furry friends like Winkie –the Autism service dog from Dream Acres for Autism and Rommy –a miniature horse with a great mission to help people (we first met him at the Autism Burns Fire Fighting event in Orlando!). Saturday March 26th the Guardians partnered with Village Walk of Sarasota, for their annual Easter egg hunt. The rain stayed away so that some fairy friends could fly, Batman even came by all the way from Gotham City! Village Walk has major holiday events throughout the year that help bring the families that live in the community together, as well as have some grandparent time! The Village Walk administrative staff holds events that help other charity organizations such as; Toys for Tots, Cookies for Troops and more. Sunday, March 20th promised a unique opportunity for members of the Guardians of Justice to partake in some crafty fun. WeSpeak for Them and Sydney the Therapy dog hosted an open-house style party and invited our members to join! The festivities took place at the “Read to Sydney” store-front located inside of the West Oaks Mall. Since we were directly across from the Mall’s Easter Bunny he hopped on over throughout the afternoon to participate. Sydney brought her four-legged friend Toby along to visit with the children. They roamed the store-front ensuring everyone was greeted and Toby handed out a few doggy-kisses.